So you’ve decided you want to own your own movable tiny house. Congratulations! Your next step is making the decision of whether you’d like to work on your home yourself or leave the building process up to the experts. Both are great choices for different situations! There are a number of factors that should influence this decision: the cost of the complete-package tiny house versus DIY-ing it is usually the first one that comes to mind, but don’t forget to weigh in your own building expertise, the amount of time you’ll realistically spend on the build, and the cost of the building tools and materials. Fortunately, future tiny home owners have a multitude of options for how their home is completed. Consider your own construction experience. Experienced builders who already own their own tools and have a workspace (more on workspaces later!) are the perfect candidate for building a DIY tiny house. These builders will save money by not paying for someone else’s labor. Those who are comfortable with building but inexperienced in plumbing and wiring may want to hire out bits and pieces of this labor to professionals. Factor in the time it’ll take to build your house. Building a tiny house is also a great project for the DIY-er with some construction experience, who would like to learn more. Building your own house is an empowering experience. Be warned, though, that the cost of materials, tools, a workspace, personal protective equipment, and consumables (such as saw blades, sandpaper, and painting supplies) can add up to more than expected. In addition, the time you spend building your tiny house will last longer than you think! As a woodworker, my personal rule of thumb when starting any project I haven’t built before is to allot 2-3 times as many hours I think it’ll take. The amount of time it took tiny house DIYers who responded to this Reddit post to build their own houses ranged from 6 months to 7 years; on average it was 2 ½ years. Finally, consider how much your time is worth to you. You’ll spend hundreds of hours building your tiny home: if you can spare the time, it’s a worthy investment. Plan for an adequate workspace. Although many people build their tiny houses outdoors, it’s ideal to have a covered workspace. This will prevent the elements- particularly rain and snow- from catastrophically damaging the house before it’s weathertight. It will also allow you to work on your house during foul weather, and keep your tools and materials safe. An indoor workspace will need to have a garage door high enough to accommodate the roof of the house, usually 13 ½’ ft high (garage doors are typically 7 ½’ high). Calculate the real cost of building versus buying. If the tiny home you’re building will be your full-time residence, be sure to factor in the amount of money you’ll spend, at the same time, for rent or mortgage on both your current home and the location you’ll build your house. Be sure to include the amount you’ve already sunk for the cost of materials in your budget. As mentioned above, plan to spend two to three times the amount of time you think it’ll take to finish– and budget for this time, paying for both your current dwelling and your workspace. Building your own house is something most Americans haven’t done since the early 19th century: it’s an accomplishment. Going to sleep in a structure you’ve built with love and sweat is a feeling unlike any other. If after reading this article, you’re undeterred by the challenges of building your own tiny house, good news– we can help! 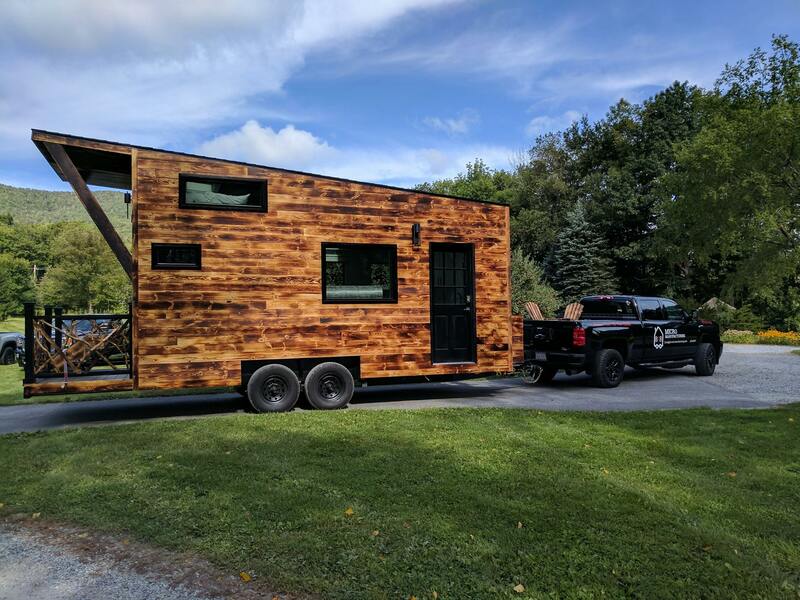 B&B Micro Manufacturing offers trailers specifically made for tiny houses, and wood or steel tiny house kits and shells. Or, if you’re thinking it may be a better investment of your time and money to buy a move-in ready house, scroll down to “Turnkey Tiny Houses”. 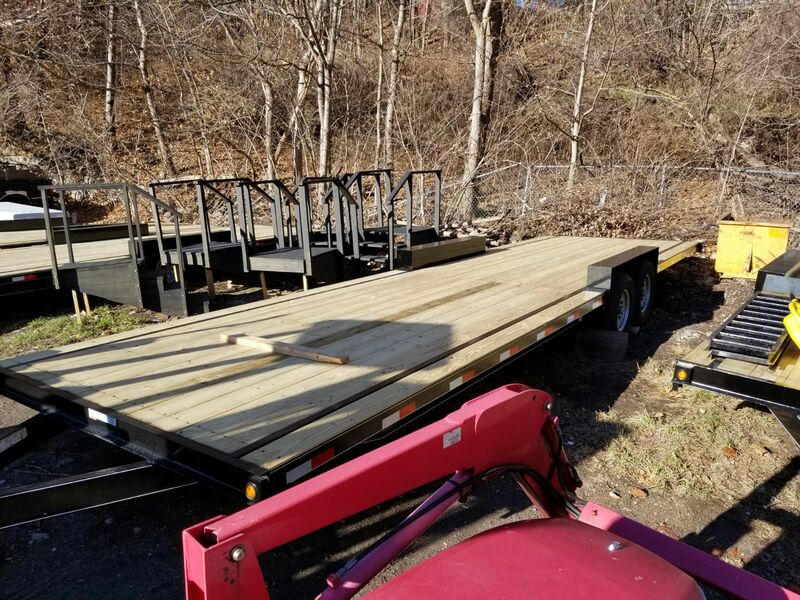 Our trailers are created specifically for tiny houses, allowing the house to be the maximum road-legal width of 8 ½’, and custom-made for any legal length (our standard trailer length is 20’, and trailers range from 20’ – 40’). Each trailer comes with a certificate of origin. 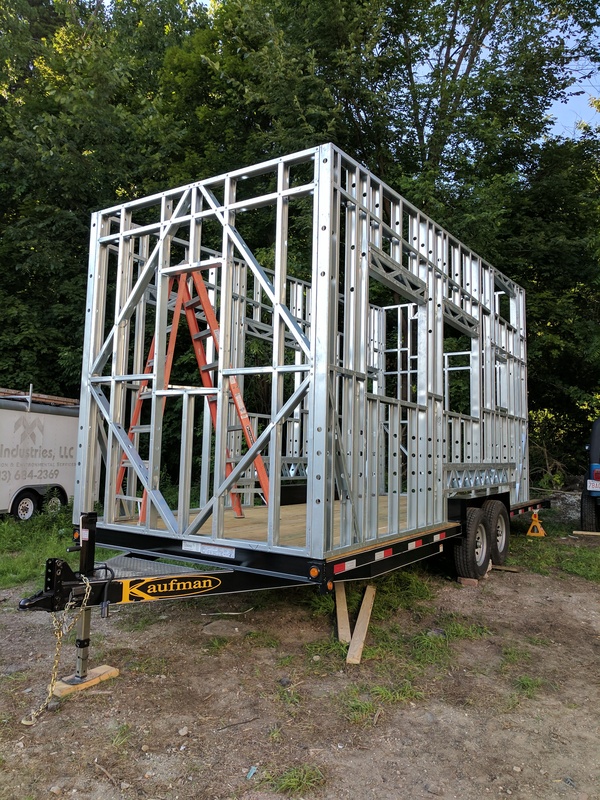 DIY tiny house steel frame kits offer an experienced builder or confident weekend warrior an opportunity to construct their tiny house on a safe and sturdy steel frame built by the experts. Purchase the frame and trailer alone, or a kit which includes roof and wall sheathing and a subfloor. Our steel-frame kits are ICC-certified and come with a 25-year warranty. Choose from any of our pre-fab steel-frame plans. Are you confident in your construction skills and interested in building a wood-framed DIY tiny house? Built atop a road-ready trailer that comes with its own certificate of origin, B&B’s tiny house shell is delivered to your door fully constructed and weather tight with framed and sheathed walls, a roof, and a sub floor, ready for you to finish. If you’re ordering a completed tiny house that’s ready to live in, know that our tiny houses are RVIA-certified. The benefits of an RV-certified tiny house are many. Certified movable tiny houses are built to strict standards so they are safe for the road as well as for living. An RVIA certification improves resale value, means the house can be parked in more places, such as RV parks, and enables easier insuring and financing. Movable tiny houses are still a relatively new phenomenon; although we’d like for tiny houses to be in their own official category for permanent living, (and are helping with the movement to make it so!) the reality is that at this point, certifying them as RVs is the best way to approach town governments, RV parks, banks, insurance agencies, and future buyers of your house. 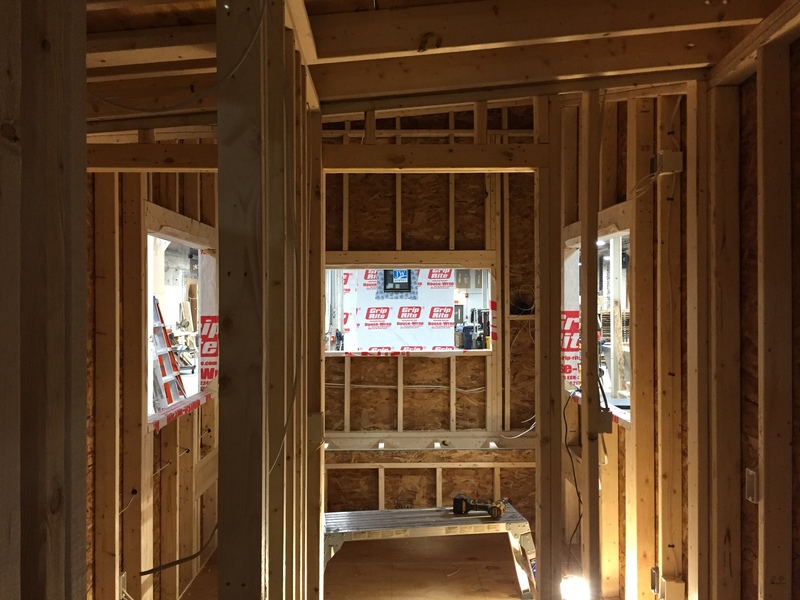 Our turnkey tiny houses are completely insulated, plumbed, wired, and painted, so you can move in they day they are delivered. Whatever you choose, B&B is here to help! Contact us today at (530)686-5680. Brodie Mobile Office at the Westchester County Home Show What kinds of toilets are used in tiny houses?